Talk to us about the choices now available in 3-strand, braid-on-braid and in specialist materials (including Kevlar and Dyneema) for sheets, halyards and control lines. TS Rigging can splice all manner of lines – put us to the test! 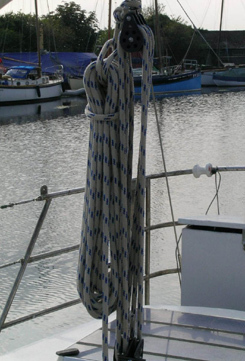 We are happy to advise on rigging changes and can also provide rope-to-wire splices for halyards. Most end fittings for sheets and halyards can be obtained quickly and at a good price and we can advise and supply you with suitable blocks and deck fittings as well. Stainless steel 7x19 wire is used for wire to rope halyards (7 bunches of 19 strands). This is a very flexible wire to go over sheaves and through pulley blocks. Braid-on-braid rope is available in a wide range of sizes and colours. We can finish wires with Talurite hard-eyes or soft-eyes and with a range of fittings, including: captive pin shackle (main halyard); snap shackle (jib or genoa); swivel snap shackle (spinnaker). Other options are available, please contact us. Rope to wire hand splicing can be done in our workshop. Ropes can be finished with whipped bitter ends or whipped looped bitter ends.